This is what I threw on after arriving in California. Don't you always want to change after a plane ride? It's sort of boring, but quick and easy was the name of the game for this trip. Not surprisingly, I tend to over-pack. This time around, I made a concerted effort not to. I packed the night before, didn't plan any outfits and took far fewer options than usual. This resulted in somewhat basic ensembles that repeat several key items. I ended up totally pleased with what I brought along. I didn't waste time fussing over what to wear, and, though I wasn't always dressed to the nines, I felt comfortable and pulled together each day. Clothes: Light wash jeans, dark wash jeans, trousers (which I didn't wear), light trench, cropped moto jacket, a few tees, a blouse, a dress (which I didn't wear), a skirt. Accessories: A couple of hats, some jewelry, a messenger bag, a clutch. Shoes: Flats, oxfords, wedge sandals. I did buy a few things that I wore on the trip, but that was more out of desire than necessity. I don't like to waste any time before showing off new goods! Speaking of new stuff, these oxfords are the $50 shoes I mentioned awhile back. They run really small, so I had to exchange for a larger size. Other than that, they're amazing! They look great and are quite comfortable. Target girls trench? Nice score! You look perfectly casually chic. Lovin' the oxfords! i love those shoes. your whole outfit is classic, and the fit of those jeans and your short hair give the look some edge too. 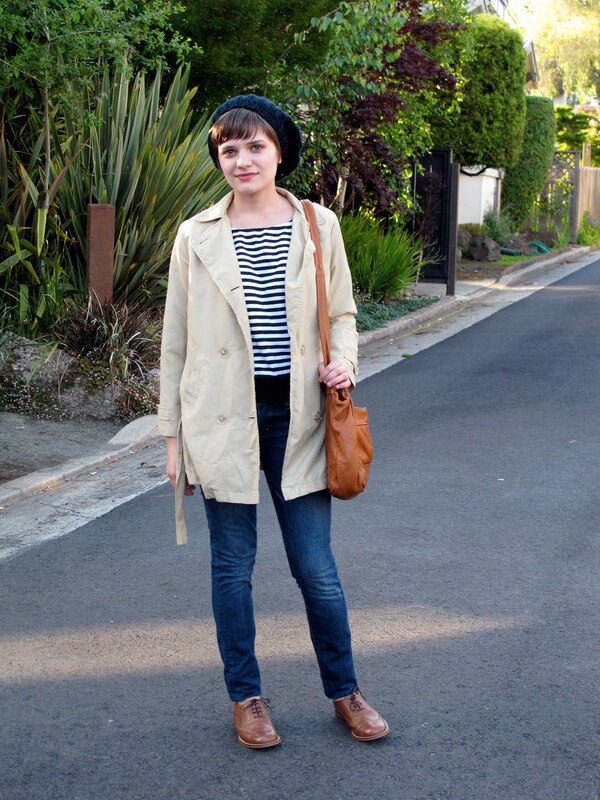 So cute ..I love the beret and trench...btw I can't believe how stylish your "leftovers" are. i like your shoes! I want to get some brown oxfords..
Also, I like finding out what other people pack on trips, I've tried different ways of figuring out how to pack light and with good pieces to mix and match, but it's definitely not something I have mastered! such a cute classic outfit, very early 60s trouffout movie. Such a chic outfit you managed to pull together, normally when I get off a plane I feel far too spaced out to put anything half decent together. 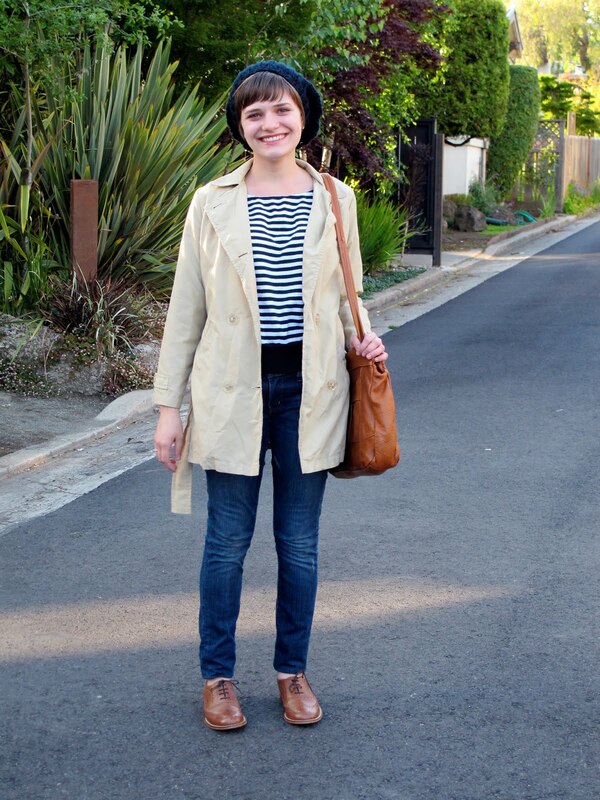 I love your trench and the bag. A hint of androgyny in the look which I'm loving. i find that i'm happier when i pack simply for a trip, too, even if it doesn't lead to the most exciting outfits ever. Where did you get the hat, that's what I need to know. I am looking for one just like it. Love it! Thanks for sharing your packing list. I always aim to pack light in case I get stuck somewhere and have to carry my bag around and it's nice to see what other people find useful (or not useful, thanks for marking unworn pieces!). Hope you had fun in Cali! you ARE a chic traveler! What About Lunch - The hat is from Payless, but it's from fall/winter. Best of luck finding one like it! Very Euro-chic! I love it! I love the colour of your jeans. It's a wonderful shade of blue and it goes well with the colour of your Steve Madden's.